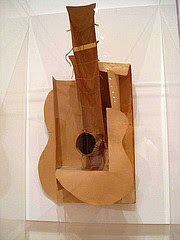 As you follow your guitar lessons this advice from Picasso can help you to become a better guitar player. From the outset you learn to play guitar by copying. Copying exercises and songs from a teacher, scales, melodies, licks and solos from music books... you copy all of these to progressively learn and master new skills. But if all you do is copy you miss out on a vital part of the learning process. You skip understanding, and understanding is what you need to grow as a guitar player and musician. Understanding deals with the why's of the material you copy. Why does it work? Why is it the way it is? Ask yourself these questions every time you copy a new piece of music. Dig beneath the surface to discover the hidden layers that support the end result. Steal each piece of music and make it your own. There's always a reason why something is the way it is. Discover these reasons and you will develop a fuller understanding that will make you a better guitar player.